Rather than suffer through a cold winter, wouldn’t you prefer some fun in the sun while benefiting from an amazing educational experience in Miami? Students will train in one of the US hot spots, Miami’s South Beach, a trendy area known for its white sandy beaches, luxurious resorts, fabulous night life and world-class shopping. Miami is truly an exotic city that never sleeps! This location is known for its beautiful people, lively entertainment, fast cars, unique food, and perfect weather. The entertainment, modeling and fashion industries are booming. Being a cultural melting pot, students from diverse parts of the world such as Central and South America, the Caribbean and Europe train at Sterling Style Academy-Miami. Receive in-class training at the heart of Miami’s South Beach. Students train in the field of personal shopping at the chic shopping areas of Bal Harbour, home to Neiman Marcus and Saks Fifth Avenue, and the Village of Merrick Park at Coral Gables, home to premium designer boutiques. 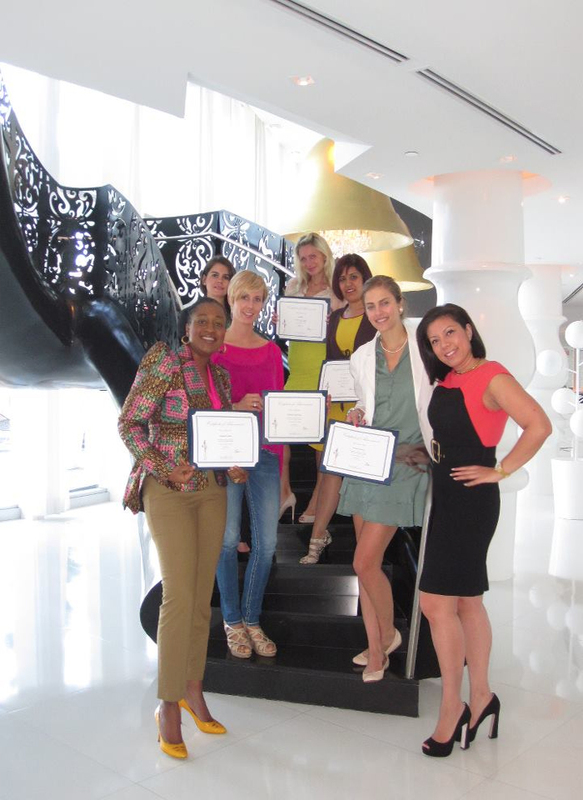 The Sterling Style Academy Miami Image Consultant Training Program prepares graduates to work with high caliber clients from celebrities to political leaders of various countries. Our graduates are educated to position themselves as industry experts. Graduates not only learn the theories behind perfecting image and style, but they also acquire invaluable business and marketing skills to strategically position themselves within their chosen markets. Sterling Style Academy Certified Image Consultants are licensed to utilize our industry-proven, copyrighted style evaluation tools (which are also available for purchase in Spanish) and the Sterling Style Academy Certified Image Consultant and Certified Image Stylist logos. This course includes our What Are My True Colors, Wardrobe Consulting and Personal Shopping eCourses, and Personal Styling and Sales, Marketing, Business Brand Identity Professional Tools to position yourself with credibility and give you that competitive edge in the market place. Our course also prepares students to join the elite, by invitation only, members of the Certified Image Stylist Group enabling consultants to place the letters CIS behind their name for credibility. How to assess facial features, body silhouettes, body types, and body proportions to appropriately dress men and women according to the image they want to project and their style preferences. Commitment to Excellence. When you invest in our training programs, you receive personalized attention focused on your growth and development from the technical skill set mastery of image and style to learning how to build your personal brand for successful marketing. Our curriculum is geared toward persevering through economic highs and lows. Faculty Reputation. Your instructors have 50 years of combined industry experience and the Sterling Style Academy’s Founder is a Wellesley Alumnae, the founding member of the Certified Image Stylist Group, member of the National Organization of Professional Women, ATD and other professional organizations committed to excellence. You will train from experts who are recognized as being in the top 2 percentile in the image consulting industry. Global Diversified Student Body and Internationally Recognized Student Alumni. Sterling Style Academy Certified Image Consultants span the globe from over 60 different countries from every continent. The leading image consultant in Japan, Yuuri Takano, residing in Tokyo, graduated from the Sterling Style Academy New York in 2005 and re-enrolled with her assistant in 2008. She has since pioneered the image consultant industry in her country, becoming a media darling, style author and premier image consultant in her market. Every dollar of your Sterling Style Academy training investment is tax deductible. As a business owner, your industry education becomes a valuable tax deduction and may be written off as business expense. Program Schedule: Monday – Saturday, 10:00 a.m. – 4:30 p.m. with assignments to be completed in the evenings and on the weekends. For more information, please contact us to receive a course prospectus. To register for the 2 Week Certification Program and make your investment today, please contact us via email to make a bank wire transfer. Upon receipt of your registration form, we will send you a Welcome Package outlining the logistics of the training program, suggestions on where to stay, a detailed agenda, and much more. Your investment does not include air fare, lodging, transportation, personal expenses, school supplies or meals. Students should budget an additional USD $750 per month. Can't attend the 2 Week Program or would like to attend a shorter course in Miami, try our 7-Day Short Certification Course. Click here for details. The Sterling Style Academy equips you with the tools you need to start a successful image consulting business.